Since my last post, Little wonders (of nature), I have become even more convinced of nature’s amazing capacity to enrapture and surprise. But, this story begins with sadness. Only a day after writing the last post, our household was visited by misfortune. My son misguidedly picked up the now rather plump Sofia, obviously deciding that she needed some more “contact” time. I sternly advised against doing this again, and taking Sofia, carefully returned her to a leaf. However, she remained in a curled-up position, and kept on falling off the leaf. I returned her to a leaf a couple of times before giving up, and carefully placed her on the soil in the pot, where I thought she would at least not incur any injury from further falls. My hope was that she would recover, and climb back up the plant to resume munching. But to my horror, she remained in a curled up position for the next few hours. I knew from my background reading that these clever caterpillars are known to play dead for a period after being attacked by a bird or other predator, but surely, I thought, by morning she would be recovered and back to her normal self. But morning came, and there was no change. A gentle prod confirmed that at least she was still alive. Was this some kind of caterpillar coma, I wondered? Periodically throughout the day I came back to check on her and found her condition unchanged. At about 4pm, as I began preparations for the evening meal, I happened to glance at the swan plant (sitting on the kitchen bench beside the window), and was flabbergasted! Sofia had been replaced by a little green bundle, her last skin, shed like a tiny shriveled sock, next to it. But more wonders were to ensue. Right at the apex of the swan plant, was a tiny little caterpillar – surely just a hatchling – munching minisculey on a young leaf. How did this little fellow get there? The plant had been in the kitchen since taking up residence at our place, so some enterprising butterfly must have flitted in to the garden centre and left her tiny self-replicating capsule concealed below a leaf. However, the appearance of this little fellow – just when his older cousin had disappeared into her chrysalis – was magically timed. I hope nature wins in this interesting series! 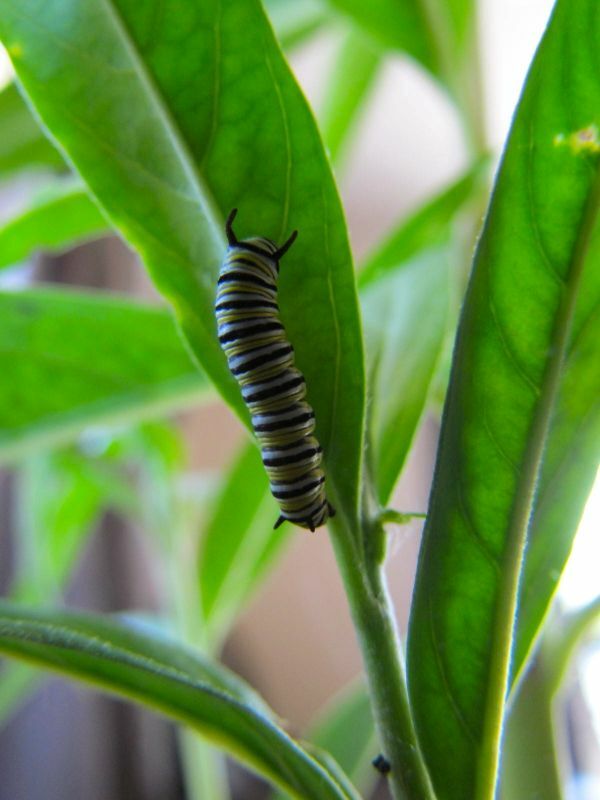 I have caterpillars that appear too small form a chrysalis too, and they emerged as small but perfectly formed butterflies. Once caterpillars go into their J-shape, they can’t create a new silk post that they use to attach themselves to their chosen leaf/twig/branch. I kept waiting for the part where you mention taping or sewing Sofia’s chrysalis to something? I have had to do that myself, and those butterflies also emerged properly formed, the key is to do it as soon as possible. Yikes! 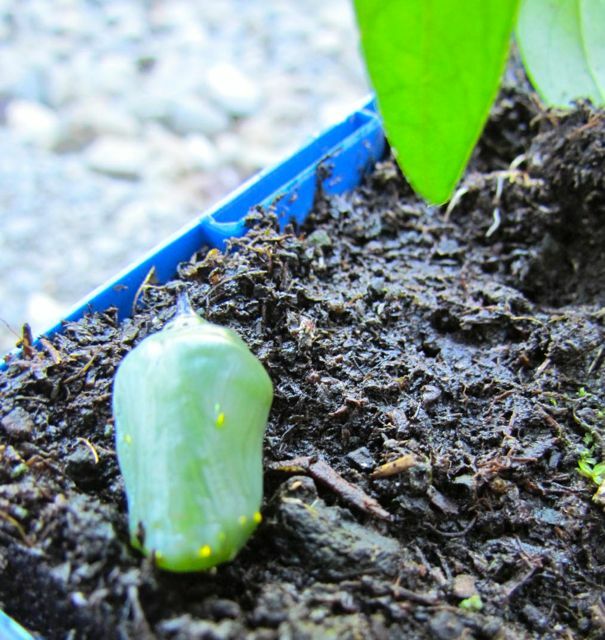 No, I didn’t attach the chrysalis. To be honest, I was too afraid of doing anything with it, for fear of damaging it, and was hoping that it would come out ok anyway… So at your prompting, I looked for some advice on what to do in these circumstances – I have now suspended the chrysalis from a pen by some cotton and laid it on a glass http://www.monarch.org.nz/monarch/forum/topic/caterpillar-turning-to-chrysalis-on-ground-help/ I just hope it’s not too late!